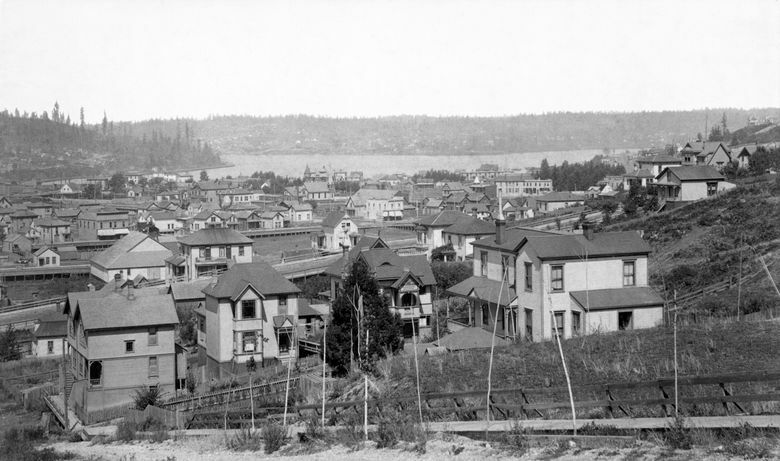 Photographers captured views of Lake Union from Seattle’s many hills in the late 19th century. THE ALMOST OBVIOUS subject here is Lake Union. The earliest panorama of the lake was recorded in 1882 by Californian Carleton Watkins while visiting Puget Sound as an itinerate photographer. 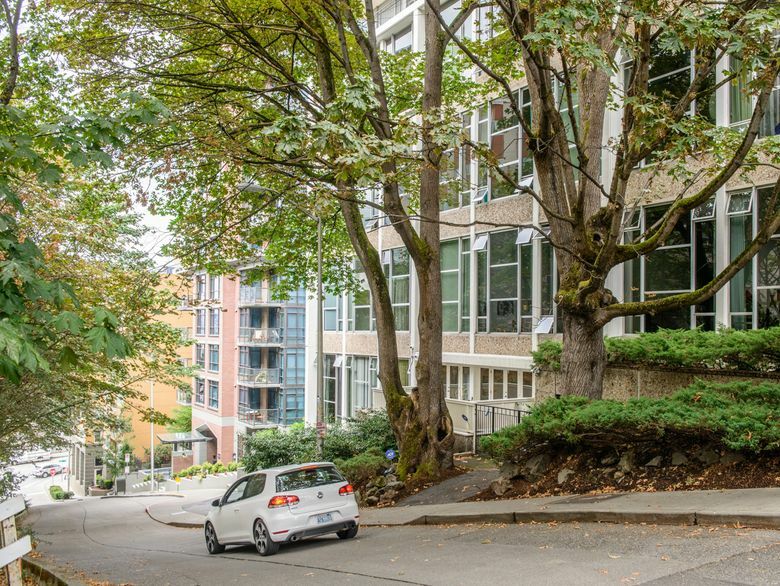 He did his shooting from a platform he built on the top of a nearly clear-cut Denny Hill. This pan by A.J. McDonald dates from about 10 years later. I struggled figuring out from which First Hill prospect McDonald took this wide view. My early intimation was that it was from near the intersection of Terry Avenue and Union Street, and this was eventually confirmed by comparing the panorama with an impressive 1891 birds-eye map of Seattle. All the homes standing in the foreground of McDonald’s subject are drawn, with considerable care given to their footprints and rooflines, into the birds-eye. I concluded that McDonald was indeed looking down a freshly graded Terry Avenue with Union Street near his back, if not at it, as was Jean Sherrard about a century and a quarter later. Just out-of-frame to the right in McDonald’s photo was George and Louise Ward’s home, built in 1882 at the then-ungraded corner of Pike Street and Boren Avenue. Wonderfully, it survives nearby at the corner of Denny Way and Belmont Avenue, moved there about 30 years ago by attorneys and preservationists David A. Leen and Bradford Moore. It is probably the second-oldest structure in Seattle, after the Doc Maynard home in West Seattle. The wide horizon of McDonald’s pan, above the north shore of Lake Union, extends from the young mill town Fremont on the left, through Edgewater (a name rarely used today) to Latona (now part of Wallingford) on the far right. Brooklyn, the preferred name for the University District in the 1890s, is hidden behind Capitol Hill. Pine Street runs left to right through the center of the pan. It was the first graded street to reach First Hill, and the 1891 birds-eye confirms it. Pike, however, was soon extended to First Hill and became much the busier street with trolleys and commerce. During his Seattle stay, McDonald recorded several other panoramas, including at least four from Queen Anne Hill, two from Denny Hill and two more from First Hill. I think it likely that by 1893 McDonald had returned to that other “city of hills,” San Francisco, where most of his surviving prints are found in scattered collections.